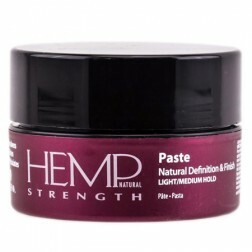 Alterna Hemp Hair Concrete is perfect styling paste providing volume and definition ultra hold without stickiness matte-finish. Essential hair product for creating an extreme styling. Alterna Hemp: Hair Concrete 2 oz. 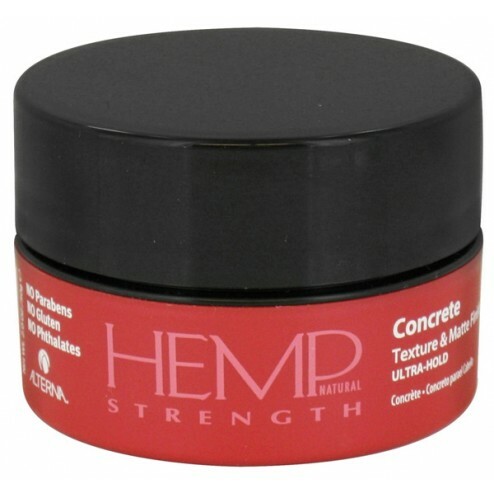 Humidity-resistant Alterna Hemp Hair Concrete prevents hair from drying out by locking in the moisture inside the hair. 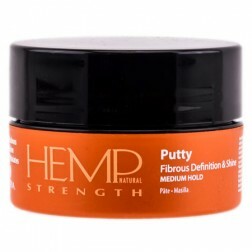 Enriched with Hemp Seed Oil amino acids and nutrient enzymes to restore your hair from within. Create endless edgy styles with this maximum hold formula from Alterna. This buildable sculptor allows you to shape and perfect your ‘do with ease. Especially useful for short cuts, you can spike, curl, smooth and lift specific strands for a structured style that lasts. The satiny, texturizing effect gives hair depth and shine that’s flexible enough to move with amplified volume, but sturdy enough to stay freshly defined. How to use: Emulsify in hands then apply to dry hair and style. Aqua/Water/Eau ,Diethylhexyl Maleate, Microcrystalline Wax, Diatomaceous Earth, Canola Oil, Glycine Soja (Soybean) Germ Extract, Zea Mays (Corn) Starch, Silica, Titanium Dioxide (CI 77891), Stearic Acid , Aluminum Hydroxide, Tocopheryl Acetate , Pentaerythrityl Tetra-di-t-butyl Hydroxyhydrocinnamate, Glycerin, Cannabis Sativa Seed Oil, Helianthus Annuus (Sunflower) Seed Oil , Triticum Vulgare (Wheat) Gluten , Vaccinium Macrocarpon (Cranberry) Fruit Extract, Persea Gratissima (Avocado) Fruit Extract, Cucumis Sativus (Cucumber) Fruit Extract , Camellia Sinensis Leaf Extract , Wasabia Japonica Root Extract, Superoxide Dismutase, Foeniculum Vulgare (Fennel) Seed Extract, Polyquaternium-10, Melanin Silanetriol, Saccharomyces/Zinc Ferment, Saccharomyces/Lysate Ferment, Saccharomyces/Copper Ferment, Retinyl Palmitate, Papain, Bromelain, Lactoferrin, Corn Oligosaccharides, Phospholipids, Copper Lysl Oxidase, Amino Acyl TRNA Synthetase, Acetyl Serine, Acetyl Methionine, Daucus Carota Sativa (Carrot) Root Extract, Fragrance (Parfum), Benzophenone-3, Linalool, Limonene, Benzyl Benzoate, Hexyl Cinnamal, Butylphenyl, Methylpropional, Geraniol, Citonellol.